John Procaccino plays Gerry, the controlling husband of Irene in Theresa Rebeck’s Downstairs. Top: Real siblings Tyne Daly and Tim Daly are Irene and Teddy, the sister and brother in Rebeck’s thrilling family drama. Basements are notoriously the dark room where the bodies are buried, but Rebeck flips the script from the start. With a comfy couch, a coffee-making machine, and a ray of light coming in from a street level window, the downstairs is the only secure space to be had in the house of Irene and Gerry (Tyne Daly and John Procaccino). Finding safety there is Irene’s brother, Teddy (Tyne’s real-life brother, Tim Daly). He is in lost-boy mode, a grown adult wandering the room in his underpants with a glazed expression on his face. He’s had a tough time of late, but just how reliable are his tales of woe and plans for redemption? Given his stinginess with details and his shaky grasp of reality, chances are he is just plain desperate. None of this is lost on Irene, who genuinely cares about her sibling, fortifying him with this sanctuary as well as with hot meals and desserts from their youth. Their interactions reveal an ominous family history involving an absent father and a cruel, alcoholic mother who left Irene a cash windfall and bequeathed Teddy nothing other than an unstable mind. Irene, meanwhile, has her own dilemma. Her husband has, over the years, broken her to the point where she has become a hostage in her own home. Her talks with Teddy reveal that Gerry has taken over the finances, denied her the chance to have children and generally terrorized her into submission. The audience first encounters him at the same time Teddy does. With Irene out shopping (at least, we hope she is out shopping and not, perhaps, stuffed in an upstairs closet), the man of the house comes down to give Teddy his marching orders. He is a big guy with a creepy calmness who cannot quite sell the story that it is Irene who really wants him gone. The second time we encounter Gerry, Teddy has indeed made a departure but not before leaving Irene with information she can use to free herself from her living hell. In a wonderfully dark resolution between husband and wife, Gerry goes full psycho, uttering menacing lines like, “You found rat poison in the basement? Maybe I was killing rats.” Irene, though, holds the upper hand, and it is clenching that pipe wrench. Despite such theatrics, Rebeck avoids melodrama and endows her work with patches of poetry. For instance, reflecting on the mechanics of human nature, Irene observes, “There’s that funny thing they say, that all your cells die every seven years. ... You’re a new person, every seven years. So since then, since we were kids, we’ve been new people how many times?” Director Adrienne Campbell-Holt knows when to be subtle and when to be harsh, exploiting the seeds of doubt that, despite what the audience knows to be true, never quite go away. Is Gerry really a madman, or a reasonable fellow with an unstable wife? How is Teddy sure of his sister’s predicament while barely understanding his own? Is Irene a victim of abuse, or does insanity run deep in the family? Late in the play, Teddy is passed out on the couch, and the odds are fifty-fifty that he is either in a happy slumber, or stone-cold dead. Teddy (Daly) makes an unsavory discovery. Photographs by James Leynse. Mr. Daly skillfully walks the line between victim and savior. 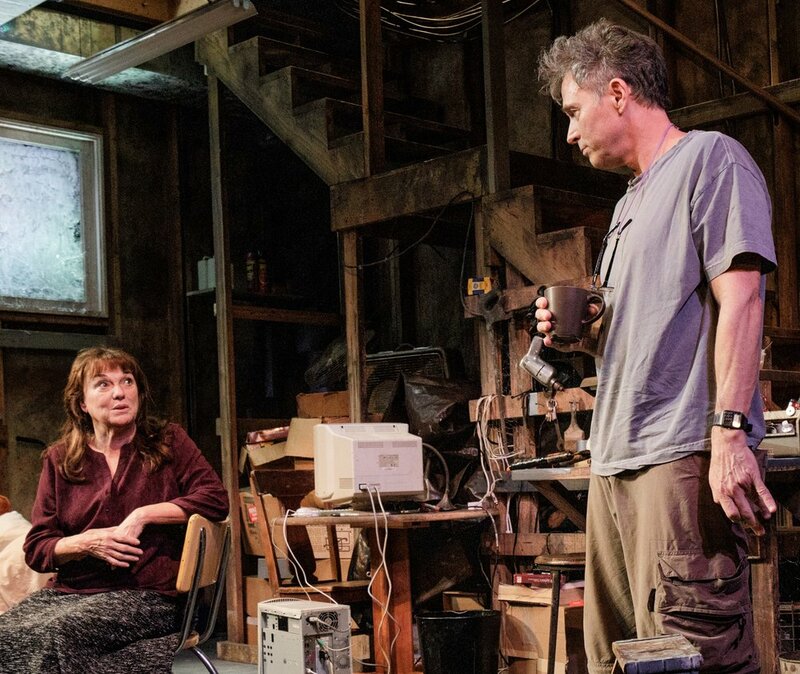 Ms. Daly, returning to the Cherry Lane, where her theater career began in 1966, pulls off the admirable feat of bringing depth to a character who has been beaten numb. And Procaccino is bone-chilling, chewing the scenery when called for, demonic when up against the wall. Among the many clever touches in the scenic design by Narelle Sissons, the smartest is the landing near the top of the staircase that leads from the unseen upstairs down to the basement. It serves as a beacon. When we spy Gerry, visible from the waist down, pausing there, the tension mounts. When a pair of female legs come into view, there is a palpable sigh of relief that Irene is still on her feet. Theresa Rebeck’s Downstairs runs through Dec. 22 at the Cherry Lane Theatre (38 Commerce St.) on a schedule as twisted as its plot. Evening performances are at 8 p.m. Tuesday through Saturday, with an additional performance at 8 p.m. Dec. 2 but none on Dec. 20. Matinees are at 2 p.m. Wednesday and Saturday and 3 p.m. Sunday but there are no matinees on Nov. 28 or 30, or on Dec. 12. 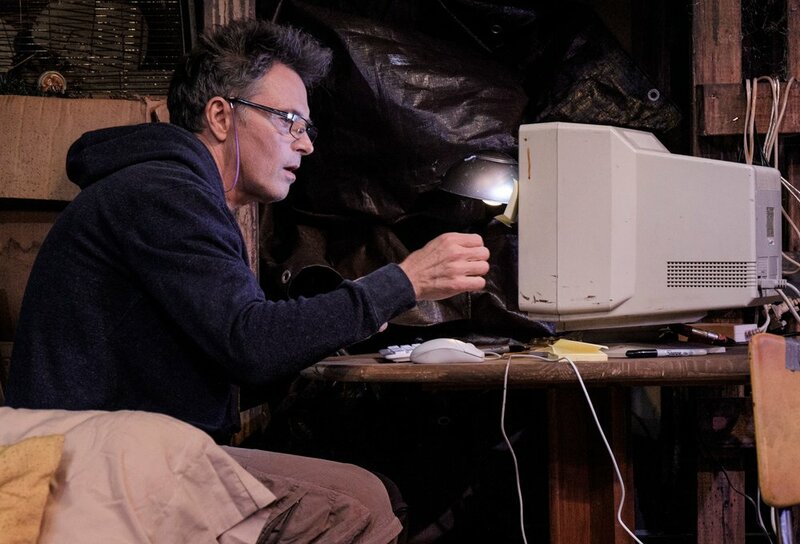 For ticket and information, call (212) 352-3101 or visit primarystages.org.